There was strong interest from buyers at the weekly Coalgate sale (30 Nov 2017) when a number of pens of Limousin females from the Ben More Limousin stud (James Family) came up for sale. 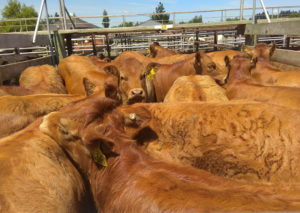 Rarely do Limousin stock come up for sale through the saleyards in this number. All were commercial cattle. Widely anticipated, interest came from both previous purchasers and new buyers. The sale was widely promoted which generated additional interest. Three prime two-year-old heifers sold to an average of $3.25/kg ($1683/hd) and three cows made $2.40/kg. Two pens of yearling heifers attracted vigorous bidding. 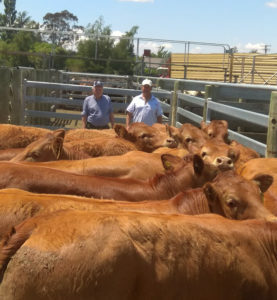 One pen of thirteen yearling heifers averaging 332kg made $4.64/kg ($1540/hd) which was thought to be a record price for a line of yearling heifers at Coalgate. Not to be out done the following pen of slightly lighter heifers (average 311kg) included eleven heifers and made a even higher price of $4.89/kg. This latter group was purchased by a new commercial Limousin breeder as foundation females. The final two pens also sold well. Two black yearling heifers (average 348kg) sold to $3.74/kg ($1300/hd) and three light heifers sold to $1080/hd. The sale left the gallery with no doubt that the market is willing to pay a premium for quality Limousin bloodlines.